When you want to get a credit card, you need to clearly understand the risks associated with the credit card. It is very easy to run up the balance on your card without really realizing it, and fall into the credit card trap. You need to work to pay off the card completely each month. You need to have a careful plan for managing your credit before you apply for a credit card. It is important to make sure you are financially ready for a credit card. Choose a credit card to apply for. This is actually the most important step when you decide to get a credit card. Offers may come in the mail for you, but they may not be the best card for you. Read the fine print and look past the introductory rate to what the rate will be after that has passed. A rate of around 15 percent is typical, but you should not choose one with a rate higher than that if you can. Look for a card with no annual fee. Instead of looking only at mail offers go to your current bank to see if they offer a credit card with competitive interest rate. You should also consider the rewards offered, and how easy they are to cash in on. Remember that if you do not pay off your balance in full each month, it is not worth having a credit card just for the rewards. Fill out the application for the card and wait to see if you are approved, and what the rate will be. Do not apply for multiple credit cards at the same time. Most people only need one credit card one hand for emergencies. More than one card makes it easier to get yourself in credit card debt. When you apply for a credit card, the bank will do a hard check on your credit. This will show up on your credit report, and if you have too many too close to when you are applying for a mortgage or other loan, it may affect your interest rate or loan. This is not a permanent ding on your credit, but you should avoid applying for one if you know you are going to apply for a mortgage in the next six months. Wait to be approved or denied. If you have no credit history or a job you may not be approved for your credit card. One option to build credit is to use a prepaid credit card where you deposit money into an account to stand as collateral for the credit card. Another is to build your credit through your bank with a small line of credit. 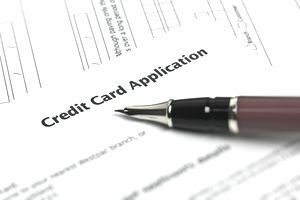 A store credit card may be easier to qualify for if you want to build your credit and do not want to have a cosigner. Store credit card interest rates tend to be much higher than a typical credit card though. Be sure to pay off your credit card as quickly as possible. Too many people find themselves in serious credit card debt after a few years. Only use your credit card if you have cash to pay it off that month or if it is a true emergency. Commit to paying off the card in full each month. Avoid having multiple credit cards, because it makes it difficult to track your spending, and to pay off everything each month. It can also lead to late payments if you forget to pay one. It is important to limit the amount of credit available to you and to avoid using it all. This can help you avoid hurting your credit score with your credit card use. If you are trying to get out of debt, one strategy many people use is to transfer the balance of one credit card to one with a zero interest rate. You can do this, but you need to stop using the card that you transfer the balance from. This will allow you to get out of debt, rather than to hold onto the debt.